Sometimes removing the terrifying hood can improve matters. The corners of your rooms aren't only for end tables, lamps and scratching posts; they're perfect locations for soaking some urine into your carpet, at least according to your kitty. Putting an end to your cat's peeing in corners means finding out why she's doing it in the first place. Regardless of the initial cause of your kitty's bathroom behavior, she'll keeps returning specifically to the corners of your room largely because she smells the scent of her urine. That smell makes her more eager to reliever herself in the same location. So your first step is to remove all traces of the smell. Just soaking the area in water and a bit of soap and dabbing it dry won't do. Blotting it dry is good initially, but if you have carpet or hardwood floors, use an enzymatic cleaner -- sold at most pet stores and general retail stores -- to remove the stench. If the problem areas are linoleum, wipe up the urine, then wet a rag with white vinegar and go over the area again. Something like a partially blocked urethra, a urinary tract infection or kidney failure can make the urge to urinate unbearable. Your cat might be peeing in corners and other inappropriate areas because she's sick. It's normal behavior for a cat to urinate outside her normal spot when she's ill -- leaving the stench of urine wafting throughout your house. A blood test, an X-ray, an ultrasound or urinalysis can show if something's not right with your little friend. Your vet can prescribe her medicine to either heal her all up or manage her condition. Cats are extremely picky about their litter. They sometimes tolerate one type only. For instance, if you switch your kitty's litter from unscented to scented, she may put her head inside the box and look it over, then turn around and proceed to squat and relieve herself in the corner of your room. Unless directed by your vet, it's usually better to keep with the same type of litter your cat is used to. If you haven't changed to a different litter and your cat's refusing to use it, you may need to clean the litter more often. Dirty litter can cause your cat to think it's way too messy inside her box, so she'll go somewhere cleaner, like the corner of your room. Daily cleaning prevents her from being overcome with nastiness. 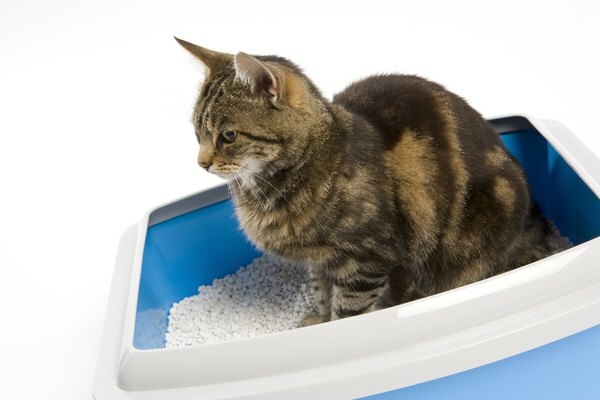 If for any reason your kitty has become discouraged from using her litter box, she may say goodbye to using kitty litter and hello to using corners and nooks. You can take steps to reduce this risk. Make sure her box is never placed in a noisy area, such as next to a dryer which can kick on and startle her. If you have multiple cats, you'll want one litter box for each cat, plus one. If your kitty is scared of her box for some reason, try switching to a differently shaped box or style. For instance, if she was frightened in a hooded box, she may approach a box without a hood. Although neutered and spayed cats are less likely to spray, some still do. In such a case, she's marking an area so she feels safer and more confident. Sometimes new smells or the replacement of your cat's scent in your house -- which can happen when you lay new carpet or replace your old couch, for example -- can cause her to spray. Other times she might be stressed because of a new addition to the house, like a puppy or kitty. The Feline Advisory Bureau advises wiping a soft towel or rag on your cat's face and then wiping it on new furniture. The bureau also suggests making sure your cat has her own toys, food bowl, water bowl, scratching post and beds. Slowly introducing a new pup or cat by keeping your resident kitty separated from the newcomers for a few days can help prevent stress.